Welcome to Arizona, Home of Papers Please! 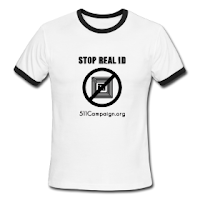 BTC - One can gather from a quick read of SB 1070 that is isn't Real ID. However, it's a lot more direct and decentralized for federal policing during a terry stop. What people in Arizona are dreading are the police stops where anyone can be arrested for not carrying proof of citizenship. Russel Pearce forgot who challenges him on the databases. As indicated in this video, a Libertarian candidate decided to run against him due to his short term memory. If Arizona Governor Jan Brewer signs SB 1070, there is a life wrecking misdemeanor waiting for American citizens who are caught running around free without their citizenship papers. Police will be stopping to check for "legal" migration. Sherriff Arpaio can impound your car if the person you are riding with doesn't have their citizenship papers and is suspected of being an illegal alien. If your an Arizona taxpayer you should put conditions or limits to criminalizing your identity, or lack thereof, if it could be you. I have no idea what this means if you are from out of state and you don't have your papers. Can you be imprisoned on a misdemeanor in Arizona for not being able to identify yourself as a passenger without a license? If so, that is really going to put a squeeze on tourism dollars. Sorry, a trip to Sedona is not worth it if this bill is signed by Governor Brewer. The Arizona state legislature just approved the toughest anti-immigration bill in the country, giving police the authority to determine people's immigration status based on "reasonable suspicion" or more bluntly put, the right to racially profile immigrants. Written by State Sen. Russell Pearce, SB1070 also makes it a crime to be an undocumented immigrant and allows anyone to sue a local, county or state agency if they believe the agency is not enforcing immigration laws. 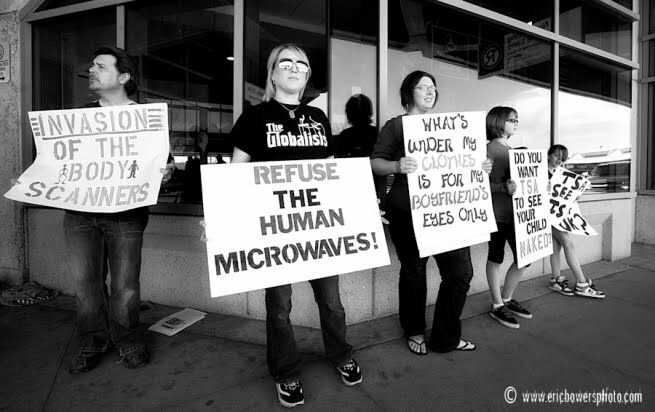 If signed by Governor Jan Brewer into law, get ready for rampant racial profiling and arrests of more United States citizens who cannot prove their right to live here. The law also promises to have a chilling affect on the economy, with unjustifiable raids on businesses and immigrants fleeing the state as a consequence of attrition through enforcement. One just needs to take a look at Prince Williams County to note the general devastation that occurs as a result of local law enforcement of immigration laws. There is still time to prevent Arizona from turning into a complete police state. Governor Brewer is yet to sign the bill into law. Tell Governor Jan Brewer to stand up to Senator Pearce and do what is right for Arizona. BTC SOCIAL COMMENTARY - Anti-National ID advocates trip, and sometimes slip on the razors edge of frail terms of agreement between political scientists. We should pan out and look at the national dialogue about the Bush machinery institutionalized and perpetuated by the Obama administration. There is a whole lot of disallowance for the right-side of anti-war. This includes a great deal of Repubican veterans who undertstand what they hate because they lost a leg on Hamburger Hill. The established anti-war cliques on the left don't talk to them. Well... Houston, tell the ranks. It looks like the anti-war Left is ready to talk. JS: Why do you think the sides don't understand each other? NW: Frankly, liberals are out of the habit of communicating with anyone outside their own in cohort. We have a cultural problem with self-righteousness and elitism. Liberals roll their eyes about going on "Oprah" to reach a mass audience by using language that anyone can understand even if you majored in semiotics at Yale. We look down on people we don't agree with. It doesn't serve us well. WASHINGTON – A broad coalition of group sent a letter Tuesday to the White House, the House and Senate Judiciary Committees, the House Ways and Means Committee and the Senate Finance Committee urging them to oppose a proposal by Senators Charles Schumer (D-NY) and Lindsey Graham (R-SC) that would include a biometric national ID card in comprehensive immigration reform legislation. Signatories are from across the political spectrum and include advocates for privacy, consumer rights, gun owners, limited government and religious liberty. Below is the full text of the letter and a full list of signatories. BTC - For Tax Day only, we are switching from our regular formatted programming to bring you a special talk with Evan Ratliff, a co-editor for WIRED Magazine who created an assignment to disappear with strategic aims to not be found. WIRED's sponsored contest had escalating tiers of money for the digital bounty hunter who could track down and catch Ratliff in his remote locations. Evan was in and out of disguises for the duration of his extended assignment. He toured with a band, became a semi-granola hippie and even adopted a disguise as balding stereotype in a suit to evade getting "caught" for prize money. He shares a very unique story of how he did his best to evade being actively identified by those who tracked him down with arcane and creative digital clues. Relax, as much as you can, in this moderately paranoid yet entertaining tale of public evasion. Ratliff is a freelance journalist whose writing appears in Wired magazine, The New Yorker, the New York Times Sunday Magazine, Outside, Discover, Men’s Journal, New York, and many other publications. A contributing editor for Wired, he is the co-author of Safe: The Race to Protect Ourselves in a Newly Dangerous World (HarperCollins, 2005), about innovation and counterterrorism. A former fellow at both the International Reporting Project and the Japan Foreign Press Center, he has reported from Russia, Cameroon, Bangladesh, Brazil, and elsewhere on science and technology, the environment, terrorism, politics, and transnational crime. Three United States Senators have written a letter to Secretary Napolitano of the Department of Homeland Security, urging the Department to reconsider the whole body scanners currently planned for U.S. airports. Senators Collins (R-ME), Kyl (R-AZ), and Chambliss (R-GA) encouraged Secretary Napolitano to consider "auto-detection" devices instead of human screeners to address privacy concerns. The Senators noted that the current technology allows airport officials to "view detailed images of passengers’ bodies" and also that other systems could "save the government and airports money on physical space for screening." TRACKING WINOS: Winemakers pitched on RFID to ward off "fraudulent wines"
Wikileaks Collateral Murder video - if you haevn't seen it yet. PARAMILITARY BACON ALERT ... according to microblogger Tracy Ward, the Kansas City Police Department is seeking to stock up parts of the city with ShotSpotter misery. "KCPD and Councilwoman Cathy Jolly are seeking federal taxpayer money ($2 million) to turn Emanuel Cleaver's porkulus project "KC Green Impact Zone" into something that more closely resembles the Baghdad "Green Zone" with a new surveillance system from ShotSpotter." Hearsay? We'll be looking for the details in the days to come. Got a flair for snooping, investigating and reporting? Do you have inside information and want to document your findings publicly, while staying private about the surveillance industrial complex? Do you hate tyrannical monstrous Godzilla sized government with no respect for scared people running around in the streets trying to get through the day? Good. We need creative, talented, detail oriented writers who understand the transpartisan news angle in order to get our conservative/liberal good work done. We need people to donate work. Let us know if you want a tax write-off for the work you do donate or if you're just a good spirited volunteer who wants a quality social justice piece placed on our blog. All volunteer writers for BeatTheChip should apply via the grassrooted parent organization, The 5-11 Campaign. "Reps. Chad Faulkner and Tony Shipley were the only legislators who were recorded as voting for HB1426. Please be sure to thank these two legislators for supporting REAL ID Nullification. To watch the video of the proceedings of the House Transportation Committee as it considered and rejected HB1426, click here." PHOENIX - According to local sources, SB 1070 goes to the Senate Committee of the Whole for a vote today. The bill currently includes the E-Verify program, creation of a misdemeanor offense for anyone who employs undocumented workers and arbitrary terry stops to evaluate citizenship. There are provisions in the bill which call for the siezure of private property; such as impounding a car for transporting an undocumented immigrant. Those opposed to the bill are organizing their defense against a federal or national ID card and gun reporting requirements embedded in the bill. Ernest Hancock plans to give an update on teh legislation's status on Liberty Radio available this afternoon. FT MEYERS - Patsy Richey, 75, needed a state ID so she could do her banking and cash her Social Security checks in the name Richey. The name matched the one on her driver's license, but it expired and she no longer drives. Her son, Rick Richey, said he mailed a request to Atlanta for a copy of his mother's marriage certificate and they said she must mail it to the county where she was married. Patsy Richey said she was married in Valdosta, Ga., but it wasn't in the records there, because it was obtained in another county. Patsy Richey couldn't remember where. Her husband, whom she divorced in 1976, died four years ago. The credit union shut down Richey's bank account, moved the money to savings and wouldn't let her have access because she didn't have a valid ID and, without a marriage license, no way to get one. "This is crazy. What is happening?" Cooper asked. Richey is not the terrorist or undocumented immigrant these new rules are meant to thwart. And the Department of Motor Vehicles recognizes this, I'm sure, which is why Ann Howard, its press secretary, assured me they will help Richey get her ID card. Other people who are having problems also can get help on a case-by-case basis by contacting the department, Howard said. "We knew this would be a learning curve with bumps involved, but we're doing well in Florida with hundreds of thousands of citizens getting this done properly," she said in an e-mail. If you need a new license or ID, visit gathergoget.com to see what documentation you will need. I don't know how many are getting turned away from license bureaus because they don't have the proper paperwork. Although Richey's case is extreme, I doubt she's the only one to become entangled in the bureaucracy of national security. - For more columns and reader forums go to news-press.com/tellmel. Contact Tell Mel at 2442 Martin Luther King Jr. Blvd., Fort Myers, 33901; 344-4772; tellmel@news-press.com. KANSAS CITY - BTC- Sidewalk sign waves can be a thankless dish of humble pie. However, the brave souls of Missouri's liberty activist strongholds are [so mmmm...Heavy Metal?] that they held the attention anchor of at least three televised news services. "THE TSA WANTS TO SEE MY JUNK!" 11 new scanners have been dispersed over America. It's 11 more than we ever intended to deal with. A proposed ban on Louisiana participation in a federal program that requires driver's licenses to have security enhancements united two organizations Monday that often sit on the opposite sides of many issues. 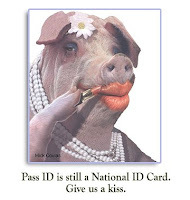 Leaders of the ACLU of Louisiana and the Christian conservative Louisiana Family Forum both supported a bill by Rep. Brett Geymann, R-Lake Charles, that would direct the state Department of Public Safety not to participate in the federal PASS ID Act, if it passes Congress. The PASS ID Act attempts to strengthen security by requiring certain information to be encoded in a driver's license. It would replace the previously passed federal REAL ID requirements, which two dozen states refused to implement because of privacy and cost concerns. ACLU state director Marjorie Esman and Family Forum Executive Director Gene Mills argued the PASS ID requirements would be invasive and could encourage identity theft. Other supporters of the bill also argued the federal security requirements would be too costly for the state. The House Transportation Committee voted 16-1 to advance Geymann's bill (House Bill 870) to the full House for debate. Opposition was by Rep. Barbara Norton, D-Shreveport, who said Louisiana shouldn't be objecting to federal legislation designed to improve U.S. security and safety. She said information already is available to identity theives on the Internet. "If you're worried about people knowing everything about you, it's already out there," she said. In 2008, Louisiana lawmakers ordered the Department of Public Safety not to implement the provisions of the REAL ID Act. BTC - This is a montage of the comprehensive battle for your private information and the use of integrated technologies to sift and evaluate your data. Pretty chilling stuff.